A new Hollow Granblue Perfect Guard appears that recycles itself..
AUTO: [Choose 1 card from your hand, Discard it] When this Unit is placed on (GC) from the hand, you can pay the cost. If you you do, choose 1 of your Units being attacked, during that battle, it cannot be hit. AUTO Generation Break 2: [Soul Blast 1 & Choose 1 card from your hand, Discard it & Choose 1 of your other “Protecting Against The Tide Banshee” from the Drop Zone, place it on the bottom of the Deck] When this Hollowed card is retired, if you have a “Nightrose” Vanguard, you can pay the cost. If you pay it, return this card to the hand. For Today’s Card we’re introducing a 《Granblue》 from the March 3rd Character Booster “Rummy Labyrinth in the Moonlight”, the 【Sentinel】 “Protecting Against The Tide Banshee”. “Protecting Against The Tide Banshee” is a Perfect Guard that supports “Nightrose” and specifically is good in tandem with “Vampire Princess of Starlight, Nightrose”. 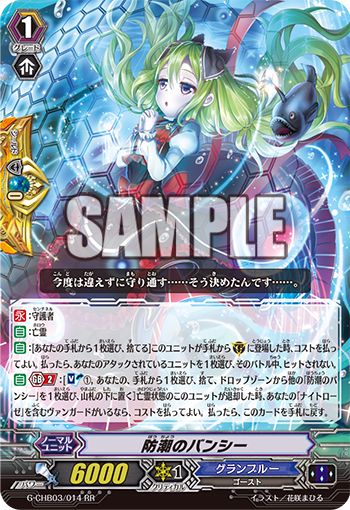 Besides the typical Perfect Guard ability, when Banshee is retired while it’s Hollowed, you can Soul Blast 1, Discard 1 card from your hand and place 1 other “Protecting Against The Tide Banshee” from your Drop Zone on the botom of your Deck, returning this card back to your hand. Now, once you’ve achieved the conditions of activating it with “When this Hollowed Unit Retires”, when that turn ends it’s Retired, or you can activate it if you Call it with an overwriting Call. For example, you use the skill of “Ghostie Great King, Obadiah” to send multiples to the Graveyard, you can aim to activate its ability. Also, since its ability returns your Sentinel to the Deck, you can avoid running out of your Deck and your Sentinels. So place multiples in your Deck! “Rummy Labyrinth in the Moonlight” contains many units that strengthen 《Granblue》, so look forward to further news!